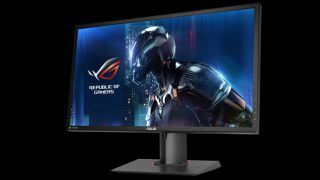 The latest Asus Republic of Gamers monitor to be wheeled out is a 24-inch panel with a 1ms response time and a blazingly quick refresh rate thanks to the possibility of overclocking the display's native 144Hz. The ROG Swift PG248Q is a full HD panel (1920 x 1080) with a refresh rate that can be clocked up to 180Hz to make the most of your monster graphics card and high frame rates. To ensure things are kept smoother still, Nvidia's G-sync technology is on board to help beat the stuttering and tearing blues. The combination of this and the juiced-up refresh rate should make for some potent and slick gaming action – and because this panel is full HD resolution, that gives your graphics card a better chance of pushing out blistering frame rates to fully take advantage of all this. There are some neat tricks available to pro gamers too, as Asus has included its GamePlus hotkey which can be used to display a frames per second counter, a timer for the likes of spawns, or it can overlay a crosshair on the screen (handy for games or modes where the crosshair is banished). There are also six preset display modes which cater for different game genres including RTS/RPG, first-person shooters and racing games. Flicker-free and low blue light technology are also present, as is getting pretty standard these days. Plus you also get a fully ergonomic stand with height adjustment along with tilt, swivel and pivot, with a pair of USB 3.0 ports alongside the DisplayPort 1.2 and HDMI inputs. The ROG Swift PG248Q will be out this month with a recommended price of £400 (around $530, AU$700).